Compared to the quick and carefree days of summer, winter can feel long and oh-so challenging. The scarcity of sunshine, combined with bitter cold and an abundance of snow, can leave us feeling depleted and down. Plus, we inevitably spend more time indoors in close proximity to others—and their germs—so we're at higher risk for colds and flu. Before we give way to doom and gloom though, the good news is that we can take steps to stay as healthy as possible through the dark days of winter. Play an active role in your health and navigate winter with a more positive outlook. Here are my 10 tips to help. 1. Eat more fruits and vegetables. This is number one on the list for a reason. We all know we need to increase our intake of fruits and veggies—especially veggies—but how often do we do it? The Canadian Cancer Society says that fruits and vegetables may help to prevent several cancers, including stomach, lung and cervical cancers. In addition, fruits and vegetables provide vitamins and minerals that are important in winter, like vitamin C and zinc. Try to ensure that vegetables and fruit make up half your plate at meals and snacks. Buy frozen fruit and vegetable smoothie blends (with spinach or kale) to make quick, healthy smoothies. My favourite quick smoothie for kids and adults alike? 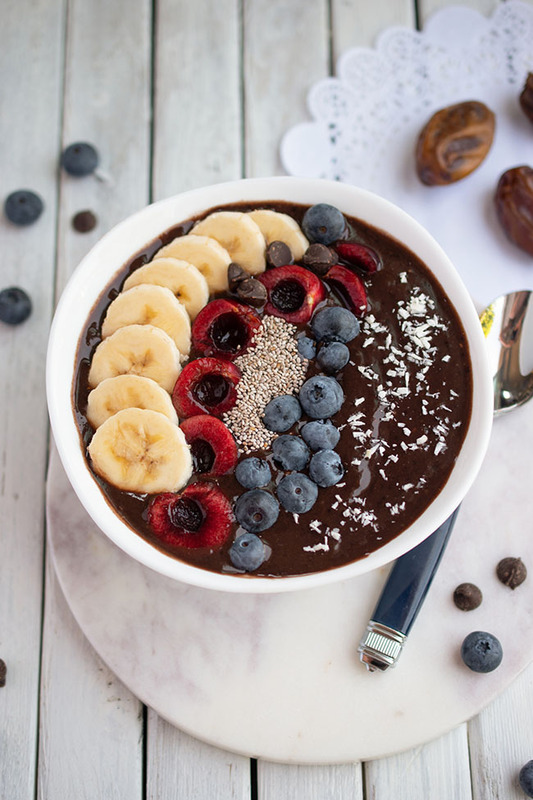 Blend a frozen banana with a cup of non-dairy chocolate milk. Creamy and delicious. Try this for a week: eat an apple every morning. Cut it up and put it on top of your oatmeal or eat it as a snack on the run. The fibre in apples helps keep you feeling full, and you won't be so tempted to snack on less healthy options later. 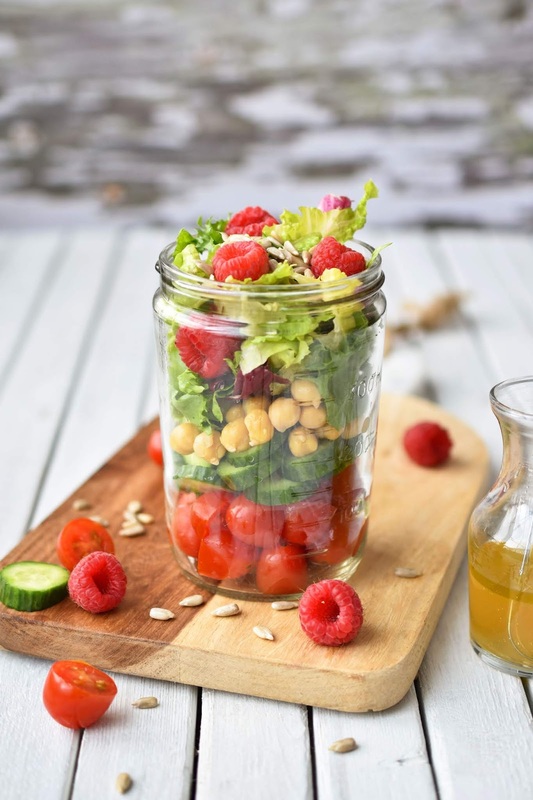 Have a salad with every evening meal. Change up the toppings - try seeds, dried cranberries, chickpeas, berries, cherry tomatoes, clementine slices. Keep a stock of frozen veggies - I like to saute frozen broccoli in a little olive oil and flavour it with garlic powder or fresh minced garlic and Bragg's liquid aminos (or tamari) for a fast, healthy side dish. 2. Switch up your salad dressing. 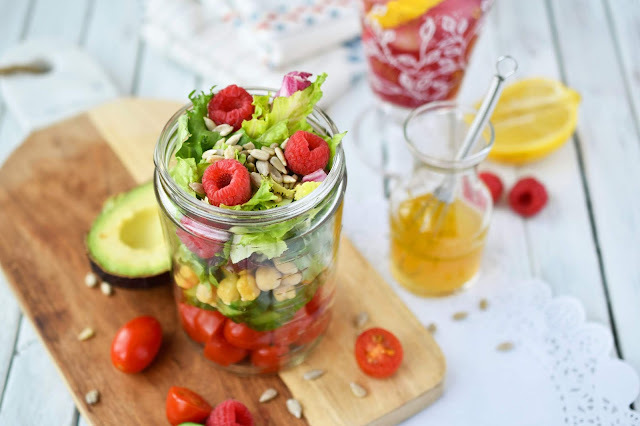 Store-bought salad dressings often contain unhealthy oils, sugar and preservatives. We like to dress our salads Italian-style with olive oil, vinegar and a bit of salt. It's simple and quick to do and you can experiment with different oils and vinegars to keep things exciting. 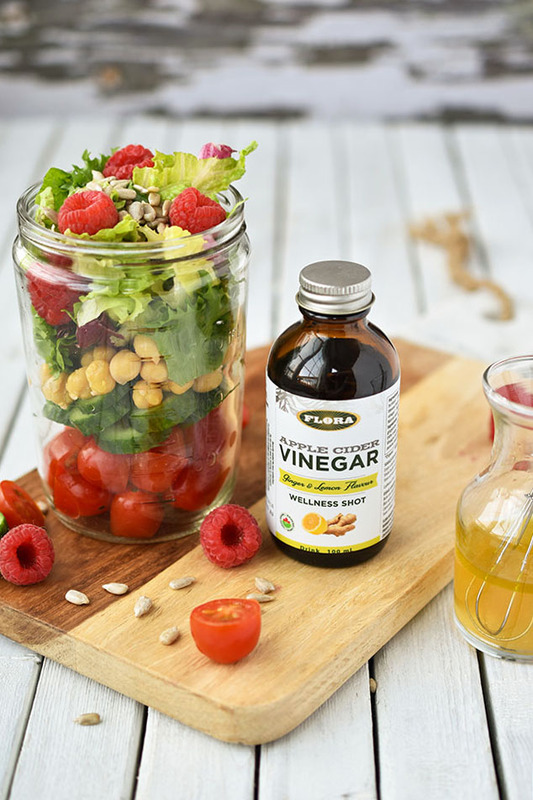 Recently, I have been dressing my salads with olive oil mixed with Flora's Apple Cider Vinegar Wellness Shots in ginger and lemon flavour. These wellness shots harness the benefits of apple cider vinegar in a more pleasant-tasting way than just downing ACV on its own. The ginger and lemon wellness shots are made up of an herbal preparation that uses freshly ground organic herbs, ACV, apple juice (for sweetness) and natural lemon flavour. The shots are quite tasty on their own (even my kids like them) and they lend a nice ginger flavour to salad dressing. Find the recipe for my salad dressing below. It can also be used over vegetables, like cooked carrots or warm mashed potatoes. 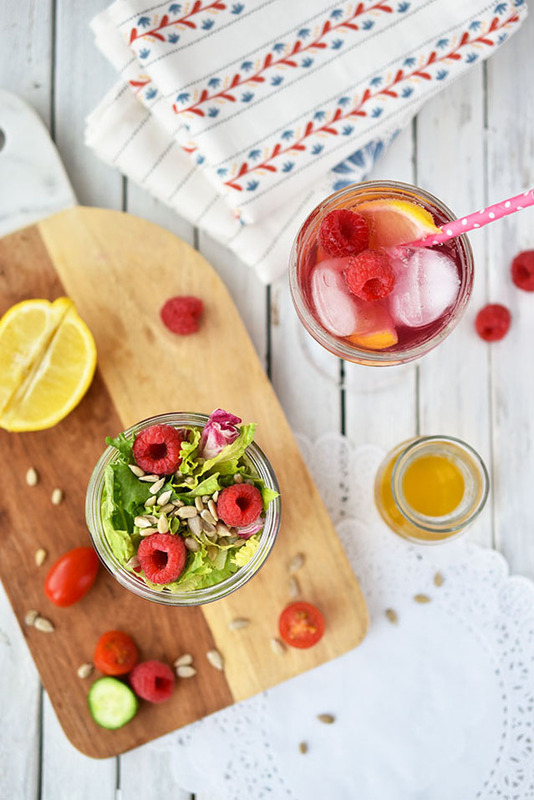 Drinking liquids is vital to your body's systems, including your heart, brain, and muscles. "Fluids carry nutrients to your cells, flush bacteria from your bladder, and prevent constipation," according to Harvard Medical School. If you do end up with a cold this winter, regular fluid consumption can help to loosen congestion. Drink herbal tea, water, spritzers, smoothies and fresh juices. Avoid alcohol and caffeine, which can dehydrate you. Soup offers hydration and soothes you when you're suffering from a cold. Check out these 40+ vegan lentil soups and stews for inspiration. 4. Support your immune system. Elderberries are a rich source of vitamins A and C, and have long been believed to support the body's immune system and help relieve cold and flu symptoms. 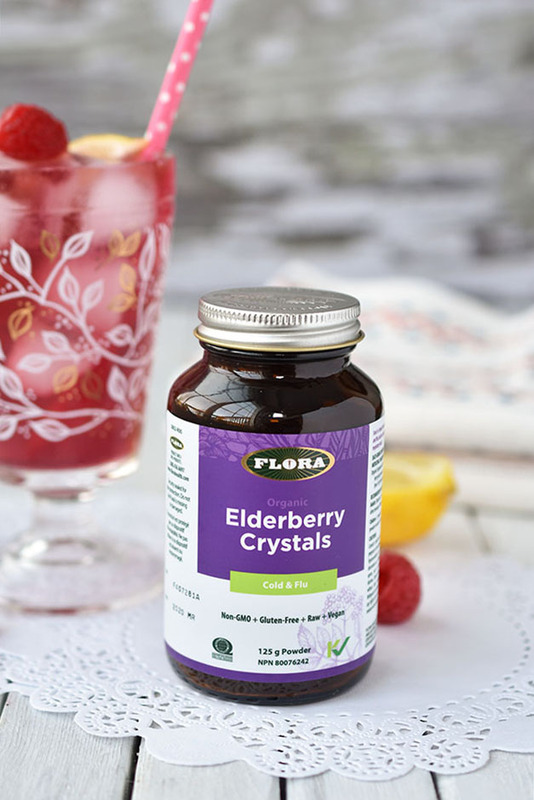 Flora's Organic Elderberry Crystals are non-GMO, gluten-free and vegan and harness the benefits of elderberries in a powder form. The crystals dissolve completely in water or other liquid, leaving only a beautiful purple hue and a gentle taste. Elderberry Crystals can be used regularly to maintain your immune system or as needed to ease the symptoms of a cold or flu. I like to mix the Elderberry Crystals in lemon sparkling water for a refreshing drink that increases hydration and supports immunity at the same time. I have included a recipe for my Elderberry Spritzer below. For a quick warming drink, I also like to stir the crystals into hot water and add a squirt of maple syrup. 5. Spend time with people you love. It's easier to meet the challenges of the busy holiday season and the long, cold winter if you have a supportive posse. Take time out to be with friends and family. Seek out people who you can count on to fill your cup, rather than negative Nellies who drain your energy. (We all know them.) Find time to meet an old friend for coffee or tackle your shopping list with your sister. Have a few friends over to help you trim your Christmas tree. 6. Do activities you enjoy. A positive outlook enhances physical and mental health. To boost your spirits, take time regularly to do activities you enjoy—maybe it's crafting, reading, playing board games, writing in your gratitude journal or baking. Get outside and get some fresh air now and then too, whether you ski, snowshoe, ice skate or just walk the dog. You knew that one was coming. But no pressure—you don't have to join a gym or prep for a marathon. (Although you can do that too if you want to.) Simply aim to get more steps in each day. Park farther from the mall or the doctor's office. Stroll around your house during commercials when you're watching TV. Carry laundry baskets upstairs. Make more than one trip with the groceries instead of trying to carry everything in one go. Go for a quick walk around the block. Walk around the mall on a quiet morning. If you have an app or an accessory that monitors steps, use it for motivation. Set a manageable step goal and increase it over time. Whether it's the hustle and bustle of the holiday season or the need to care for others who are ill, the season places a lot of demands on us. Take time each day for mindfulness. You don't have to meditate, just take a few minutes to "be in the here and now" and focus on breathing more deeply. Notice your racing thoughts and recognize your preoccupations. Stop and be still for a moment. I can't stress the importance of this enough. Wash your hands frequently—after you shake hands, when you get home from shopping, when you're about to prepare food, when you're about to eat. Not to be too paranoid, but there are germs aplenty on everything you touch. Wash 'em off and you'll have a better chance of avoiding colds and other infectious diseases. In between handwashing episodes, try not to touch your face, particularly your mouth, nose and eyes, all areas where germs can enter your body. 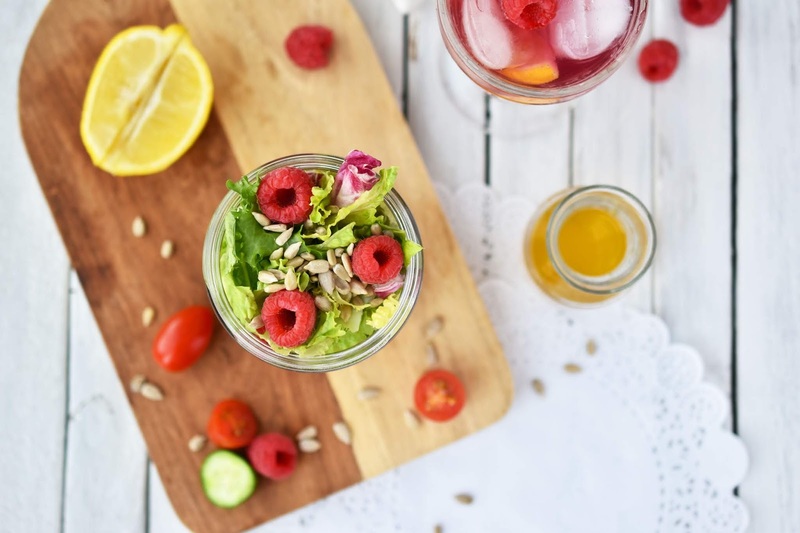 Treating yourself may seem counter-intuitive when you're aiming for optimum health, but it's all about balance. Good mental health requires you to be kind to yourself. And treats don't have to be food. Buy yourself a new stationery set, set aside 30 minutes to read a good book, or watch your favourite Netflix show while enjoying a cup of hot cocoa. Of course, I'm not against a yummy sweet now and then either. Deprivation isn't healthy after all. 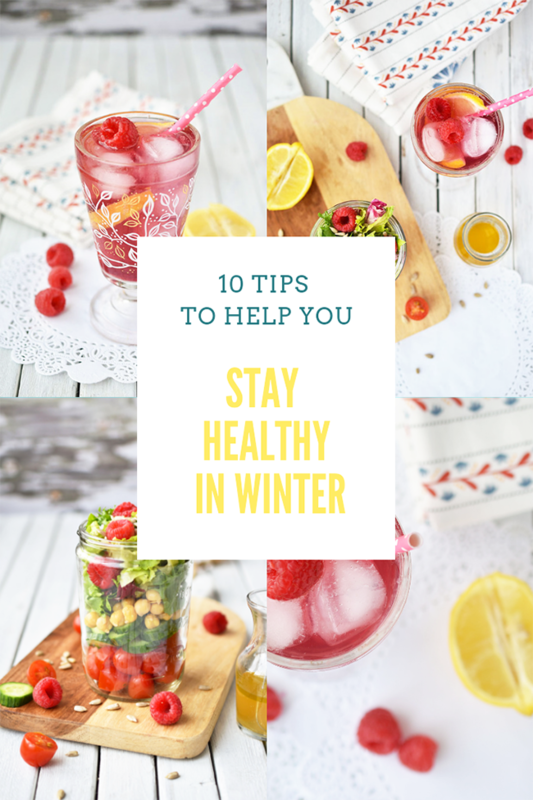 What are your tips for staying healthy through winter? How do you treat yourself? 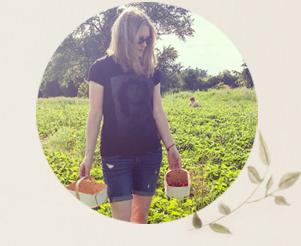 My thanks to Flora for partnering with me on this post. I have been using Flora products, like Udo's Oil™ and Floravit® (iron), for many years. 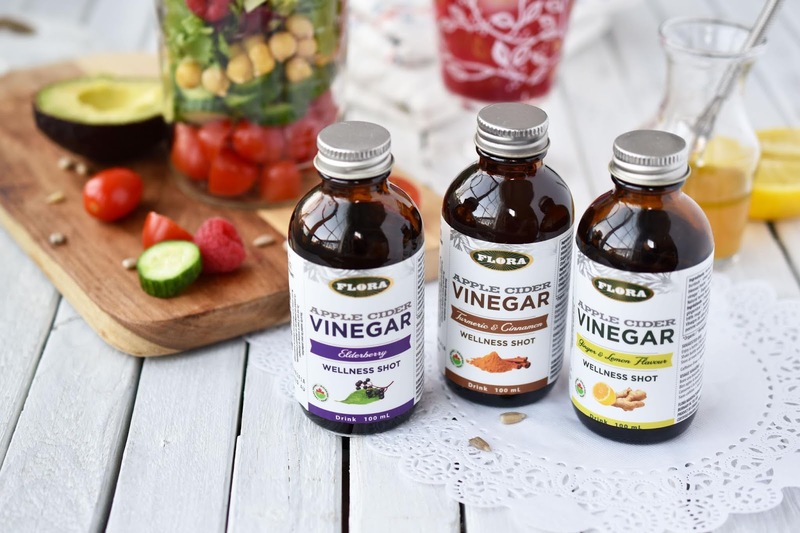 Flora has been manufacturing and supplying premium herbal products since 1965. The company's roots stretch back to Germany in the early 1900s, where Dr. Otto Greither, grandfather of current owner, Thomas Greither, dedicated his life to the discovery, production and distribution of natural health care products. Flora has preserved his original dedication to making herbal remedies with maximum purity, quality and potency. Whisk ingredients together in a small bowl and drizzle over salad or carrots or warm cooked potatoes. Pour lemon sparkling water into a glass. Stir in Flora Elderberry Crystals and stevia. Squeeze in lemon juice. The mixture will foam at first. Wait a moment until it settles. Enjoy over ice! I love these helpful tips, perfect timing! Great tips! I am going to bookmark this! Colourful recipe, and helpful tips. Cheers. Thank you! I love a colourful meal, don't you? 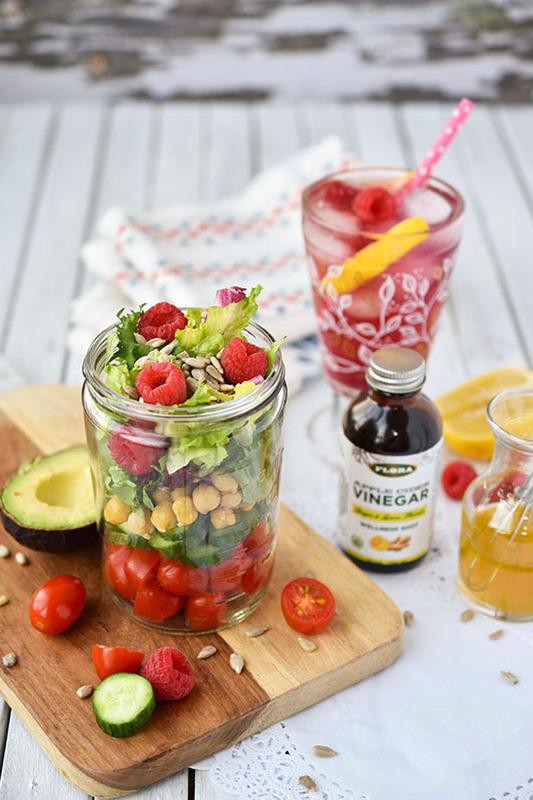 That apple cider vinegar sounds really good and the salad looks great. Good tips! And that Elderberry Lemon Spritzer looks delicious. 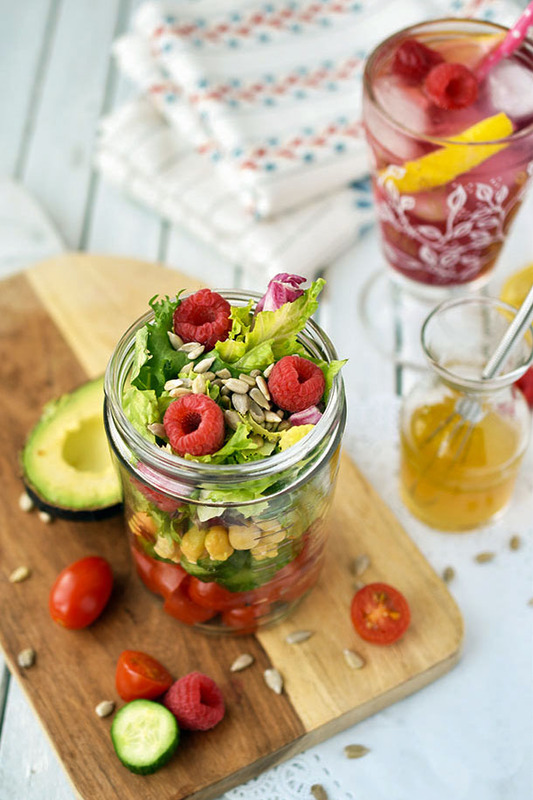 The salad in the jar looks amazing! I love raspberries!! Great post.....I'm going to see if I can find the Flora Apple Cider Vinegar Ginger & Lemon Wellness Shot in town. The Elderberry shots look interesting. I'd definitely try those. I haven't had a head cold in a few years, and I attribute that to (luck), and rinsing my mouth out with hydrogen peroxide once a day. I know for me being mindful means thinking of all these tips and taking care of me. I fully agree that one needs to play an active role in keeping oneself healthy especially in the winter with all the flu and colds out there. I try to drink plenty of water and eat my fruits and veggies to stay healthy! 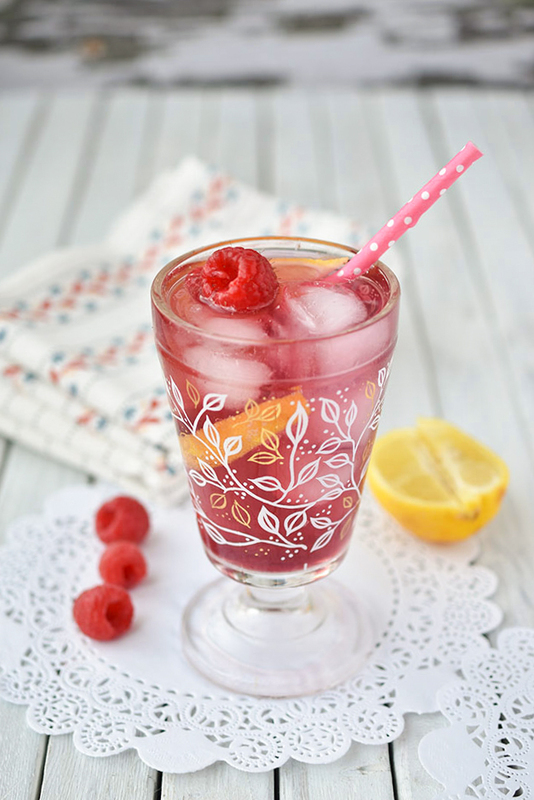 The Elderberry Lemon Spritzer looks refreshing! I agree, taking care of yourself is important. I try to keep hydrated by drinking water. 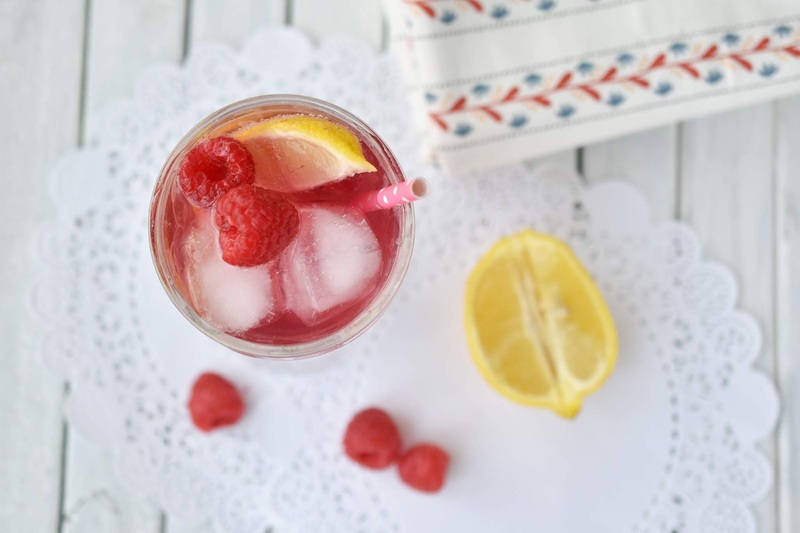 These are some very helpful tips.I love the elderberry lemon spritzer recipe. I started taking the ACV wellness shots recently - it takes a little getting used to, but it's not terrible! Great tips, I got myself an exercise bike to use when the weather is too bad to walk. I keep junk food out of the house so I'm not tempted. Great tips and reminders of ways to maintain health! Thanks great tips and recipes that appeal to me. Great tips! I definitely need to eat more fruits and veggies!! Thanks for the apple cider vinegar nudge, time for me to incorporate it again. Never hurts to remember tips to keep healthy. And don't forget to wash your hands. Thanks for all the great tips. I really do need to exercise more in the winter. I tend to get lazy when the cold weather hits.